Looking back now, it’s hard to believe just how many times this team has been on the verge of playoff extinction. On Nov. 25th, as running back Saquon Barkley raced down the field en route to a touchdown, the Eagles season was on the verge of playoff extinction. One week prior, the Birds were throttled by the Saints, 48-7, in a game in which they were never in it from the start and looked totally overmatched. And while injuries played a big part in the Eagles lack of success that day, it was hard to believe just how hard and fast the defending Super Bowl champions had fallen. Now, the Birds faced a 19-3 deficit against the New York Giants, with one more Giants score basically ending the game and rendering the last five games meaningless as far as most of the fans were concerned. It’s hard to say what went through the players’ minds at that point, but the Birds drove down the field to score a touchdown and then, with the Giants driving once again, Malcolm Jenkins made what may have been a season saving interception. Stepping in front of Odell Beckham at the 2-yard line, Jenkins interception not only prevented New York from going back up by two scores, but catapulted the Birds to a comeback victory. A win the following week against the Redskins put the Eagles at 6-6 for the season, but a loss in Dallas the following Sunday, in a game in which both Lady Luck and the referees seemed to conspire against the team, made their playoff chances a precarious one at best, especially with tough games against both the Rams and the Texans looming. But the Birds surprisingly defeated the Rams on the road, and then, facing a one point deficit against Houston with 2:04 left and starting a drive at their own 11-yard line, drove down the field with Jake Elliott kicking a 35-yard field goal with no time left to give the Eagles the victory. Elliott seems to miss the kicks that any good kicker should regularly make. Yet, he is as clutch as they come when it counts, and his game winning field goal had, once again, prevented the nail from being driven into the Eagles coffin. With one week left to go in the regular season, and facing the Washington Redskins, a team that was now on its 3rd string quarterback, most had no doubt that the Eagles would be victorious. But a victory alone would not be enough, as the Birds needed a Bears win over the Vikings in order to keep their season going into January. Luckily, Chicago still had a shot to earn a bye on the final week of the season, should the 49ers upset the Rams. But what if the Rams got off to a big lead? Would Bears coach Matt Nagy decide to rest his players in the 2nd half, knowing that he had nothing to play for? The Eagles did their part, and the Bears played most of their starters in the 2nd half, even when it was evident that their victory would be for naught. Perhaps it was because Eagles coach Doug Pederson and Bears coach Matt Nagy are friends, having both worked on Andy Reid’s staff in Kansas City? The Eagles knew that to reach the Super Bowl again, they would have to take a much more difficult path this time, needing three straight victories on the road. And the first stop was, ironically, Chicago, to face the same team that helped them get an invite to the playoff party in the first place. And once again, the Birds faced a one score deficit late in the 4th quarter with Nick Foles needing to drive them 60 yards for the go-ahead score. And once again, the team was one play away from their season ending when they faced 4th & Goal at the 2. Enter Golden Tate, who had been acquired in a mid-season trade, which many questioned as a bad move. But on this day, it was Foles pass to Tate that resulted in the go-ahead touchdown. But a short kickoff gave the Bears a great opportunity to drive down the field from their own 42, and with 10 seconds left it was up to Bears kicker Cody Parkey to win the game. And as the kick went up and straight down the middle, the Eagles season seemed to finally have come to an end. But wait…Doug Pederson had called a timeout to ice the kicker right before the kick took place. Surely, that stuff never actually works does it? But as Parkey kicked again following the timeout, this time, the ball did not go straight down the middle but started to slice to the left. And as a tri-state area watched with bated breath, the ball hit the goalpost and started to make it’s way downwards. There was still the chance that the ball could fall in, away from the end zone side of the lower post, resulting in a Bears win. A few inches here and there would make the difference, but as the ball bounced back toward the end zone, Philadelphia exhaled. Once again, the Eagles had avoided the nail in their coffin and had survived to see another day. And a fan base which had finally witnessed its first Super Bowl victory in amazing fashion just last season started to wonder if lightening could strike twice. But the next hurdle to be overcome for the Birds will not be easy. The Saints may be the toughest test the Eagles will face should they continue this amazing journey, and the crowd inside the New Orleans Superdome will do everything in its power to make sure the Eagles next game is their last. The Birds are an improved team, and a healthier one, from when they faced New Orleans back in Week 11. But the Saints are well rested having earned a bye last week, and motivation will not be a factor in playoff time. If the Eagles 2018 party were to end down in the “Big Easy”, no one would be surprised. This team, after all, has been playing with house money for some time now. But just as Bill Belichick and Tom Brady needed some good fortune bestowed on them on the way to three Lombardi trophies in four years (2001-2004), perhaps it is Doug Pederson and Nick Foles that are now riding the wave of good fortune? If anyone can pull off an upset, it is this Eagles team that somehow, someway, always seems to escape elimination. A team that looked hapless just a few weeks back is now hopeful that this amazing journey will continue. The Philadelphia Eagles, one year removed from their first ever Super Bowl title, have been doing a lousy job of defending their status as champions. A record of 4-4 halfway through the season, with three of their four losses coming in excruciatingly painful fashion, have the faithful pulling their hair out and wondering if 2017 was simply a mirage that never really happened. With the team opening up the 2nd half of its season against the Dallas Cowboys, a team that has been mired in mediocrity not only this season but basically since the turn of the century, this matchup seemed like the perfect tonic for whatever has been ailing the Birds. And the oddsmakers must have felt the same way, as the Eagles were seven point favorites going in. But when Philadelphia went on offense to start the game and promptly went three and out, I couldn’t help but think of Han Solo in those classic Star Wars movies looking over at Chewbacca and stating, “I’ve got a BAD feeling about this”. That bad feeling continued for the first thirty minutes as the Eagles went into halftime down 13-3. This team’s ineptitude at the beginning of games is puzzling, as they have now scored a total of 21 points during the 1st quarter all season, with 14 of those points coming in one game against the lowly New York Giants. The Birds did manage to crawl out of their hole to start the 3rd quarter and eventually tied the game at 13-13. But on the two occasions that they clawed their way back into a tie, Dallas’s offense, which was held in check for most of the first half, would drive down the field without much resistance to retake the lead. Down 27-20, the Birds reached the Dallas 30 yard line at the two-minute warning of the 4th quarter. But on 3rd & 2, a swing pass to Corey Clement was sniffed out for a 5-yard loss, and the following play, a pass to tight end Zach Ertz, fell just one yard short of the first down. And while the Eagles did get the ball back with 38 seconds left, it was too little, too late. That’s the kind of season it’s been my friends. This team, instead of resembling a Super Bowl champion, looks very much like the 7-9 team of two years ago. That was Doug Pederson’s first year as head coach, and that team also had the habit of losing close games that they could have won had one or two plays gone the other way. Sitting at 4-5, the Eagles now find themselves heading to New Orleans to face the Saints, who just happen to be the top team in the NFC, a spot that the Birds held for most of last season. Add to that the fact that the New Orleans Superdome is not an easy place to play, and the Saints feature one of the best current coach/quarterback combinations in Sean Payton & Drew Brees (second only to Tom Brady & Bill Belichick in my opinion), and one can see why the Eagles started off as nine-point underdogs. The good news (if there is any) is that the Birds should be able to score on this defense. The bad news is, can they actually stop the Saints offense? Both starting cornerbacks for the Eagles (Ronald Darby & Jalen Mills) are out, with Darby out for the remainder of the season. 2nd year man Sidney Jones will return this week, and will have to earn his paycheck as the starting outside corner for the first time since his college days against a dangerous Saints offense. Opposite him will be his fellow 2017 draft pick Rasul Douglas, who allowed eight catches last week in his first starting gig. 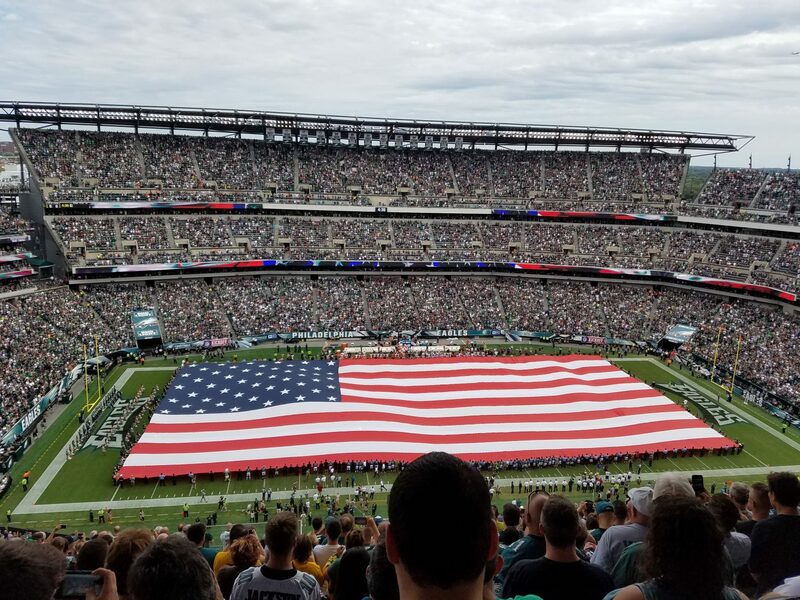 For some reason, I think that the Eagles will play with a lot of pride, and actually keep it close. The question is, is this team good enough to win? Birds lose this game, 28-24. And let’s hope the Redskins & Cowboys do as well. Otherwise, we may be throwing the 2018 Eagles season out with the trash on Monday morning.